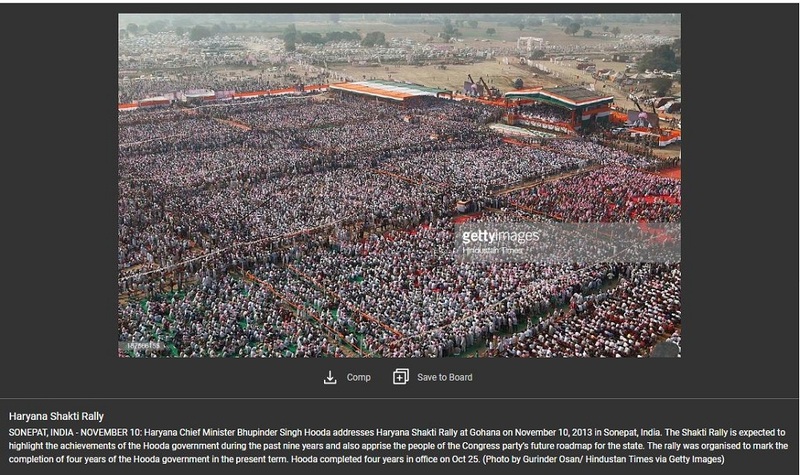 No, this is not a photo of Rahul Gandhi’s rally in Bikaner, Rajasthan. 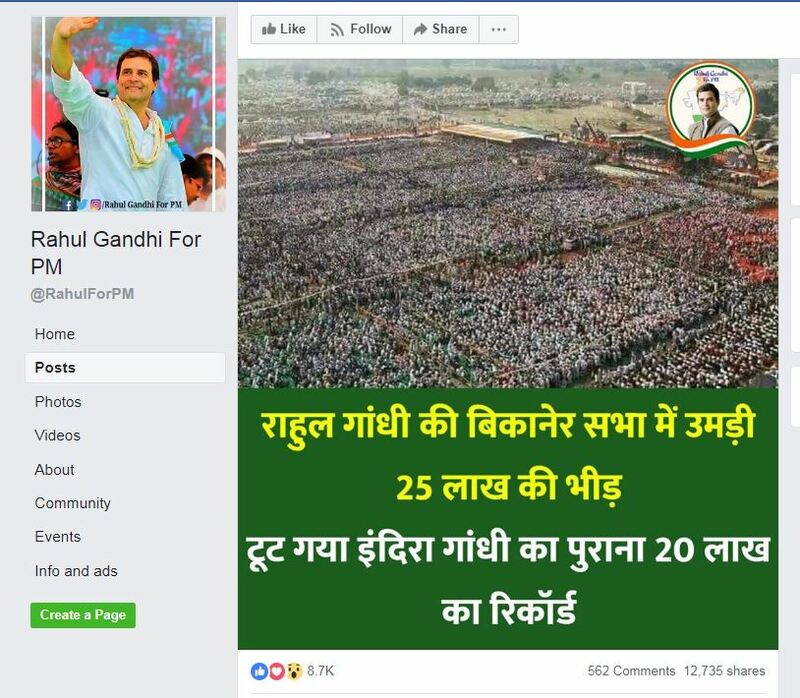 A Facebook page named ‘Rahul Gandhi for PM’ on Wednesday shared a 2013 photo of then Haryana Chief Minister Bhupinder Singh Hooda’s rally in Sonepat as Rahul Gandhi’s rally in Bikaner, Rajasthan on October 10, 2018. 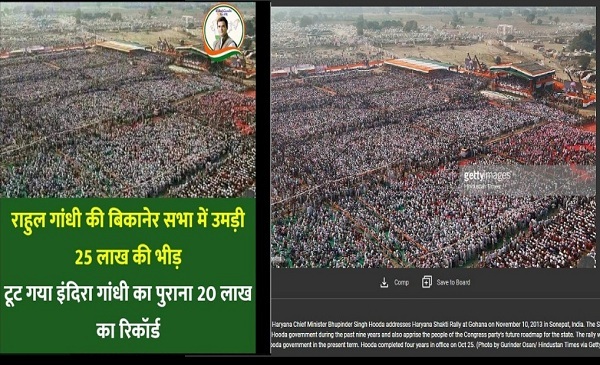 The page, which has over 2,80,000 followers on Facebook, shared a photo claiming the Congress president drew a record crowd of 25 lakh, beating the previously held record by his grandmother and former Prime Minister Indira Gandhi. The post has already received over 13,000 shares on Facebook, at the time of writing this story. BOOM did a Google Reverse Image search and found the original photo on stock images website Getty Images. 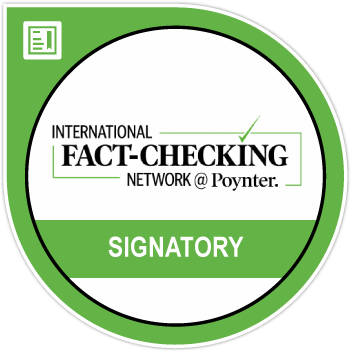 Click here to view the original image. The image was shot by photographer Gurinder Osan of the Hindustan Times. The ‘Haryana Shakti Rally’ held on November 10, 2013 by then Chief Minister Bhupinder Singh Hooda of the Congress party, was organised to celebrate four years since his government had taken power in the state. A side-by-side comparison shows it is the same photo. Rahul Gandhi addressed the ‘Maha Sankalp’ rally in Bikaner on Wednesday.